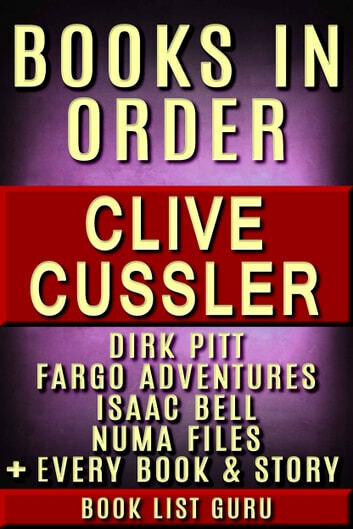 By knowing the Dirk Pitt book order, you’ll enjoy Clive Cussler’s books far more. • a Clive Cussler biography. Plus, this ebook is yours to keep on your tablet, phone, computer, or ereader, so the info you need is always right at your fingertips. • experience characters developing as the series progresses. • witness plot twists, which impact future stories, in the correct timeline to enjoy the overarching plotline. • meet interesting new characters at the right moment. Clive Cussler Books in Order helps you to read the Dirk Pitt books in order, just as Clive Cussler intended. Everything is right there on your ereader. You can track what you read, so at a glance, you’ll see just where you are in a series. New releases are added fast, so your checklist is always be up-to-date. Get a biography of your favorite author in one bite-sized chunk. Any alternative titles are listed so you don’t buy a book you’ve already read, saving you time, money, and frustration. As if all that isn’t enough, you can also grab a bestselling thriller as my gift just by clicking on the link at the back of the book. So what are you waiting for? Get the best Clive Cussler book list available. 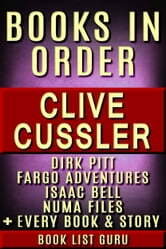 Books related to Clive Cussler Books in Order: Dirk Pitt series, NUMA Files series, Fargo Adventures, Isaac Bell series, Oregon Files, Sea Hunter, Children's books, short stories, standalone novels and nonfiction.